A nie, nie Kfiry. Teraz mają chcieć kupić od Rosji ponad 15 MiGów-29. Trochę mimo wszystko tego nie rozumiem, mamy do czynienia z państwem o sumarycznym PKB nominalnym o 20% większym, niż Polska. Nawet przy wyraźnie mniejszych wydatkach procentowych (podobno 0,8% PKB) zakup i utrzymanie nawet z dwu eskadr nowych WSB (albo używanych w porządnym standardzie) nie powinny stanowić istotnego problemu. Szczególnie, że nie inwestują ani w sprzęt dla floty, ani dla wojsk lądowych, ani wreszcie w ponadnormatywną liczebność (łącznie 80 000). Albo zatem mamy do czynienia z politycznym sabotażem sprawy, albo wskaźniki ekonomiczne są picowane, albo wreszcie klasa polityczna kradnie w sposób niepojęty. Przecież likwidacja lotnictwa stawia pod znakiem zapytania sens istnienia argentyńskich sił zbrojnych jako takich. W zasadzie teraz poza jakimiś szczątkowymi jednostkami sił specjalnych czy lekkiej piechoty i bardziej rozbudowanymi jednostkami straży przybrzeżnej nic innego nie ma sensu. Poza jednostkami morskimi utrzymującymi połączenie z Antarktydą Argentyńską, do której Buenos Aires rości sobie daleko idące pretensje. A skoro te pretensje nakładają się na roszczenia innych, warto być w stanie odganiać stamtąd konkurentów. Tyle że i ten odcinek leży, nie są w stanie od 10 lat naprawić lodołamacza „Almirante Irizar”, kupili niedawno, od Rosji cztery Nieftgazy, ale dlatego, że jako mające ponad 20 lat kosztowały czapkę śliwek. Co oni zatem, nie mając, jak Meksyk czy Filipiny, permanentnych wojen partyzanckich, robią z funduszami, pozostaje tylko się zastanawiać. Skoro wydają cirkaebałt połowę tej kasy co my to winno ich być z palcem w d... stać na półtorej eskadry szesnastek nówek nie śmiganych. W ich warunkach to właśnie lotnictwo i marynarka są kluczowe, wojska lądowe siłą rzeczy pełnią rolę drugoplanową. Najwyraźniej kasa na armię płynie tam "do odpowiednich ludzi na pewnym poziomie". Jest jeszcze opcja, że historia o tym, jakoby politycy bali się wzmocnienia armii z uwagi na bezpieczeństwo własnych sempitern nie jest tak do końca wyssana z palca. Pronunciamiento wkurzonego panującymi w kraju porządkami wojska to rzecz poważna, zawsze może się udać. Ale musi się też utrzymać, również w warunkach presji międzynarodowej. Jeżeli armia jest silna, można zakładać, że presja ograniczy się do apeli, pogróżek i jakichś tam sankcyj. Ale wyobraźmy sobie, że teraz w Argentynie wojskowi robią pucz. Klasa polityczna na to robi KOD i wzywa do ratowania demokracji. Jeżeli w tym celu nie trzeba montować całej floty, wystarczy pchnąć któregoś „Waspa” z sześcioma AV-8B i pięcioma Abramsami na pokładzie oraz niszczycielem do towarzystwa, a i tak junta stanie w obliczu konieczności bezwarunkowej kapitulacji przed taką potęgą, prawdopodobieństwo takiego działania zwiększa się radykalnie. Ale gdyby skasowali ze trzy brygady (jedną pancerną i dwie zmechanizowane) to ich potencjał bojowy by wzrósł, a nie zmalał (zakładając że zaoszczędzoną kasę przeznaczą na zakupy sprzętu). Przecież przy takim wyposażeniu owe brygady to fikcja całkowita. Nadal jednak pewnie jeden Wasp wystarczyłby do pacyfikacji, także spoko. Whats is the Armed Force?, we have Armed Forces, which are the Ejército Argentino (EA, Argentine Army), the Armada de la República Argentina (ARA, Argentine Navy) and the Fuerza Aérea Argentina (FAA, Argentine Air Force). Sadly the truth is our Armed Forces are at their minimum expressions, badly funded, badly equipped if equipped at all and with morale underground. After the 1982 war, the democracy from 1983 to today worked to undermine and punish the armed forces to make sure they were beat and humiliated so they wont ever think about taking power. Then some traitors, former left terrorist that got to politics, politicians and the media worked to completelly destroy any good image of the Armed Forces and put deep in the peopes mind that military people are evil, that everyone is a genocide and the only goal of the military is to torture people. Even when 90% of the military personal in service wasn’t even born in the last dictatorship and are just young people that wants to protect the country. Then they were used as scapegoat to blame for everything wrong the governments do, to look at the past to divert public attention. Also in the ’90s the Menem presidency signed an humiliating agreement with the UK that practically meant the unilateral disarmament of Argentina. The Madrid Treaty and its secret points. The situation of the Armed Forces is bad, VERY BAD. Most of their equipment is obsolete. The budget is 90% for paying salaries of active and retired personnel. The Armed Forces were historically the industrialist engine of Argentina. The oil industry, the chemical industry, the steel industry, the aircraft industry, the nuclear industry, the automotive industry, the naval industry, all were founded and developed by military people that wanted Argentina to become independent for real. Like Generals Savio, Mosconi, San Martin, Perón. All military industrial programs were cancelled or halted indefinitely in time. With exceptions of the Nuclear and Space agencys that went to civil hands but kept the core technicians, scientist and military directors ending in the success they are now. In the early ’70s there was a program called Europe Plan to buy weapons and know-how and machinery to build them. It was Europe because the USA refuses to help Argentina industrialize and only wanted to sell obsolete useless trash, when France and Germany sold whatever we asked, they designed things specially for us and sold us machinery and technology. The goal of the Plan Europa was to not just make weapons to not depend on foreign suppliers, but to then export its fruits to the civilian market. Thats how license-built french cannons ended not only in new argentine cannon designs but also in steel tubes that Argentina today is one of the main global exporters. The technology to build the German Meko Frigates ended with naval capabilities to build modern large ships to export and supply commercial and oil companies, as the TR-1700 submarines with the giant steel roller (special design made fo Argentina and still today’s the most silent and fastest diesel electric submarine in the world). All of that was purposely destroyed by the civilian governments in the 90s and the 2000s, specially the Kirchner’s administration that launched so much hate to the Armed Forces, they even had in offices terrorist that killed people and attacked the state under democratic governments in the 70’s. Now I will tell you the state of our armed forces by each Force. It is so bad that even Bolivia or Botswana could invade us. EA (Army). By far, the force that most learned and acted in consequence from the 1982 war. Salaries are very low, at the point many quit and join police forces or security companies. Most soldiers dont volunteer by vocation, but to have a payment. Many soldiers are the lowest of the society and were caught making armed robbery and stealing things from the Army. Corruption is deep. Every year FAL rifles are stolen (one time 200), munitions, grenades, etc. The Army fear punishment by politicians, at the point the guards in the military bases have prohibited to use their guns. This week 2 criminals attacked one guard post and he couldn’t fire, he had to let them beat him and hand over his rifle and ammo. If he had defended himself he would end up in jail and the media would say he is a typical torturer that killed 2 poor young guys that had to steal to eat (seems they eat bullets). All this makes the Army have all its units incomplete. Every single base in the country has skeleton crews. Brigades that have the regiment numbers, regiments with 3 companies with less than 80 soldiers. Tank squadrons that operate with 2 or 3 crew members instead of 4 per tank. The Army have no antitank weapons at all. Politicians never want to buy anything that is a weapon. The air defense is the same from 1982, with the difference the Roland II systems were decommissioned without replacement. The Tank forces, once the mightiest in South America, now are out powered by Chile’s tanks. The situation is so bad that the main news about the Army is that they bought uniforms (we were so lame that there were lots of uniforms types mostly bought by the soldiers themselves because the Army couldn’t provide replacements if they destroy the provide one, so they had to buy one for exercises). The equipment acquisition main news is about new civilian trucks painted in green for logistic purposes. The TAMSE tank production plant was closed in the ’90s and machinery destroyed. There are 100 unfinished tank hulls rusting outside the plant. The FAA (Air Force). This is the most sad side of the state of how defenseless we are. The Air Force, by most means, is DEAD. There are no fighters in service. All Mirage III, Mara’s and Finger’s were decommissioned without replacement. The Air Force lost is supersonic capability. Of the 36 A-4’s bought in the 90’s with F-16 systems as previous step before the US released F-16 block 30 in the 2000s, only 6 are flight worthy. And they are unarmed, they have no long range air to air missiles nor precision bombs or air to ground missiles. There is even a deficit of trainer aircraft. Most pilots resign to fly in airliners. Air defense is non existent. British Tornadoes and now Typhoons routinely violates Argentine air space at the point people take pictures of them over the Patagonia mainland when they are flying in airliners. Politicians don’t care about anything of this. Politicians will never put a cent for the large investment needed to refound the Air Force, a program that will need minimum 20 years and 15 billion dollars. The Pucaras never were updated and Lockheed Martin when got the concession of the Military Aircraft Factory, in the ’90s, destroyed every tool and blueprints of it. From nearly 100 made, only 26 are flight worthy with the same 1970 systems. The same that fought in 1982 although it was a Counter Insurgency plane. Of the IA-63 advance trainder, only less than 20 were made and Lockheed destroyed every tool and machine for it in the 90’s and produced parts of it out sourced to themselves in the United States. There is 18 more IA-63 to be completed and governments always announce it but after 20 years not a single one was finished. All the parts to complete those IA-63 must be bought from Lockheed Martin and imported from the US. The ELINT intelligence aircrafts were decommissioned without replacement. There is no AEW of AWAC capabilities. So bad too that they are losing ships on dock. As the Malvinas War Veteran ship ARA Santísima Trinidad. Last week a Corvette Meko 140 got lose from dock and hit a cargo ship docked near it. No one of the crew did nothing… That shows how low training and responsibility in the Navy are. The fleet lacks of any air defense units. They only have point defense for self defense of the ships and it is obsolete with systems and missiles from 1970. The surface to surface combat capabilities are stuck in the 80’s with block I MM-38 Exocets, that are, by all means, obsolete and useless since the 2000. Of the 4 Meko 360 Frigates (destroyer fr the Navy), 1 have propulsion problems that can’t be solved because a reduction gear is of british design and they block its replacement. Of the 6 Meko 360 that were to be built in the country, not a single one was made. Of the 12 Meko 140 corvettes to be made in the country only 6 were made in the last 2 with 10 years each to be completed. Of the TR-1700 subs 2 were built in Germany and 4 in Argentina. Only 2 were started and halted in the 90s at 70% and 30% completion. The 2 german built were never updated and are the same from the ‘80’s. Of the 2 U-209 subs only 1 is operative and have problems to submerge. Submarine combat torpedoes were decommissioned in the 90’s without replacement. The Naval Aviation has only 3 of 12 attack airplanes operatives. Super Etendard from 1982/83 with the same systems and AM-39 Block I Exocet they came with. Several ships have their sonar and radar damaged and never repaired. The only icebreaker we had to operate in the Antarctic got in fire in 2007 and millions of dollars and 9 years later the repairs are not finished yet. Corruption between, the cost we have paid for it would have bought us one and half new Ice breaker in Finland, were it was made. As you see there is a lack of funding, lack of spares, a moral on the ground, lack of equipment, lost capabilities complete negligence from the politicians. We are just sad… We are a piece of meat waiting to be devoured in a world of wolfs. Zapewne tak jest. Niemniej jednak nikt nie da im gwarancji, że za 10 lat otoczenie międzynarodowe będzie równie stabilne, coś nie stanie się w Brazylii czy wreszcie w okolicy nie będzie odbywał się jakiś akt rywalizacji amerykańsko-chińskiej. A wojsko tak zapuszczone, jak ich, odbudowywać w razie czego trzeba będzie do stanu używalności przez czas rzędu dekady właśnie. Natomiast Wielka Brytania najgłębszy kryzys przeżywa chyba właśnie teraz, aczkolwiek już wcielenie „QE” będzie oznaczało jego złagodzenie. Gdyby Argentyńczycy obstalowali w porę i w uporządkowany sposób jakiś sprzęt u Rosjan (bez wielkiej przesady, na poziomie proporcjonalnie podobnym do Wenezueli, czyli z 40–50 Su-30, ze dwa bataliony zmodernizowanych T-72B czy T-90, coś z OPL na poziomie S-300 lub chociaż Buków, parę Bastionów i Urany dla okrętów), mogliby rzucić Brytyjczykom bardzo ciężką rękawicę, mając przy tym sposobność schowania się w cieniu Syrii, Ukrainy etc. W 82. Royal Navy miała 55 niszczycieli i fregat. Kolejna sprawa - wtedy istniała brytyjska flota handlowa, wystarczyło tylko ją "zmobilizować" na potrzeby task force. Czym teraz Brytole mieliby przerzucać swe siły i zaopatrzenie? Sami o tym pisali/piszą. O "dziurze lotniskowcowej" po wycofaniu HMS Illustrious nie ma co wspominać. Utrata czterech dużych okrętów bojowych w 1982 była dla Royal Navy bolesna, ale w sumie do przełknięcia. Przy dzisiejszych stanach podobna skala, przecież niewykluczona w przypadku sumiennego przygotowania się Argentyńczyków do wojny i przy braku osłony lotniczej, byłaby krytyczna dla możliwości wykonywania przez flotę zadań na przestrzeni dekady. Podrzucenie na opanowane wyspy dwu kompanij czołgów klasy T-72B3 sprawiłoby ciężki problem kontrdesantowi — taki przeciwnik jest chyba ponad siły nawet niezmodernizowanego Challengera 2. Jedynym bezdyskusyjnym atutem Brytyjczyków są AOP z Tomahawkami, ale mimo wszystko nie jest to moc zdolna powalić kraj zdeterminowany do osiągnięcia ostatecznego celu. Jeżeli Argentyńczycy chcieli faktycznie odzyskać wyspy (lub wywrzeć presję w celu uzyskania korzystnego rozwiązania politycznego), przez zaniechania przespali najlepszy od dawna czas, a podobny szybko się nie powtórzy. W 82. Royal Navy miała 55 niszczycieli i fregat. Kolejna sprawa - wtedy istniała brytyjska flota handlowa, wystarczyło tylko ją "zmobilizować" na potrzeby task force. Czym teraz Brytole mieliby przerzucać swe siły i zaopatrzenie? Nowy brytyjski lotniskowiec HMS Queen Elizabeth typu Queen Elizabeth, został ochrzczony dziś w szkockim Rosyth. Imię okrętowi nadała – co zdarzyło się po raz pierwszy od ponad 15 lat – królowa Elżbieta II. Odmiennie, niż nakazuje tradycja, monarchini dokonała chrztu jednostki, symbolicznie rozbijając o jej kadłub butelkę whisky wyprodukowanej na szkockiej wyspie Islay. Odejście w tym przypadku od tradycyjnego szampana miało podkreślić silne związki Szkocji z resztą Zjednoczonego Królestwa (Szkocka Biała Księga, 2013-12-02). Dwa lotniskowce typu Queen Elizabeth, o długości 280 m, wyporności 65 tys. t i zasięgu 10 tys. Mm (18 520 km) są najpotężniejszymi okrętami, jakie kiedykolwiek zbudowano dla Royal Navy. Początkowo lotniskowce będą przenosić tylko śmigłowce AgustaWestland Merlin Mk 2 wyposażone w system wczesnego ostrzegania Crowsnest, służący do śledzenia celów powietrznych, morskich i lądowych w dużej odległości. Okręty zostaną także uzbrojone w 20-mm zestawy Phalanx, kierowane radarowo, o szybkostrzelności 3 tys. strz./min. Po zamontowaniu i zintegrowaniu wszelkiego wyposażeniu, HMS Queen Elizabeth rozpocznie próby morskie w 2017, a następnie zostanie przekazany Royal Navy przed końcem tego samego roku. Okręt będzie stał na czele grupy lotniskowcowej, w skład której wejdą też m.in. niszczyciele rakietowe Typ 45 (Miliony na wsparcie niszczycieli rakietowych, 2014-06-23), a także atomowe okręty podwodne typu Astute (Wodowanie HMS Artful, 2014-05-19). Spodziewane jest także, iż operowanie z jego pokładu samolotów F-35B Lightning II w wersji skróconego startu i pionowego lądowania (STOVL), które zostaną zakupione przez rząd Wielkiej Brytanii od Lockheed Martina, rozpocznie się w 2018. Przewiduje się, że Ministerstwo Obrony W. Brytanii nabędzie co najmniej 48 samolotów F-35B. W ich przypadku tani (przynajmniej w zakupie) wypełniacz miałby chyba sens, mniejszy żal w przypadku strącania kamieniami przez plemiennych bojowników. Jeszcze w temacie na co nie stać Argentynę. Bangladesz stać na Su-30SME - nówki. Ugandę też było, co prawda na starszą wersję. Co potwierdza, że w Argentynie problemem nie jest kasa, bo na ten tuzin czegokolwiek poniżej F-35/Rafale/Typhoonów daliby radę się szarpnąć, a brak woli politycznej. Wojsko ma tego sprzętu nie mieć, to miało nie będzie. Wojska lotnicze Argentyny zakupiły samoloty Super Etendard od Francji. Ale jaja ! Ale jaja ! Powstrzymam się od grubego żartu o pani Macron. No i 10 milionów dolarów za samolot, który ma wartość tylko i wyłącznie dla Argentyny to cena jakby paskarska. Hmm.... coś mi się przypomina jakby w tomacie "próby kupna po 2-krotnie zawyżonej cenie....od Francuzów". Może importowali tam Klicha/Siemoniaka na doradców ? Pojawiła się informacja, że Argentyna jest blisko FA-50. 12 sztuk, pożądana liczba 24 przekracza możliwości nabywcze biednego kraiku. Obiektywnie rzecz biorąc, jeżeli nie zamierzają rzucać rękawicy Albionowi, ten typ jest całkiem na miejscu. Jak się odmłodzić o kilkanaście lat? Pomyśleć o bułgarskich planach zakupów Super Hornetów. Jeżeli dobrze pamiętam, informacja o bardzo poważnej chęci zakupu nawet 48 takich maszyn pojawiła się niedługo po rozstrzygnięciu polskiego przetargu myśliwskiego, nawet chyba w tym gronie zazdrościliśmy im przyszłej potęgi, przy których bledły nasze Jastrzębie. Trochę czasu upłynęło, a oni wrócili do tematu. Uderza jednak podobieństwo pomiędzy argentyńską i bułgarską metodą kupowania samolotów. Eksperci południowoamerykańscy kreślą taki domniemany na razie obraz sytuacji: ARA San Juan szedł na północ na niewielkiej głębokości, a nie na powierzchni, aby nie narażać jednostki i załogi na efekty sztormu w tym akwenie. Problemy z akumulatorami, z których korzystano podczas rejsu podwodnego, się nasiliły. Pod wodą doszło do kompletnej utraty zasilania, co spowodowało, że okręt wyważony za pomocą zbiorników balastowych na tzw. neutrum, płynąc pod wodą na sterach głębokości i śrubie – zaczął nurkować. Być może nie udało się awaryjnie przejąć sterowania sterami głębokości. Bez zasilania nie można było natychmiast szasować zbiorników balastowych – czyli wypchnąć z nich wody za pomocą sprężonego powietrza. A na szas ręczny zabrakło czasu. Schodzący coraz głębiej okręt dotarł do granicy wytrzymałości kadłuba sztywnego (ARA San Juan był dwukadłubowy), czyli poniżej 200 m… Nastąpiła implozja. 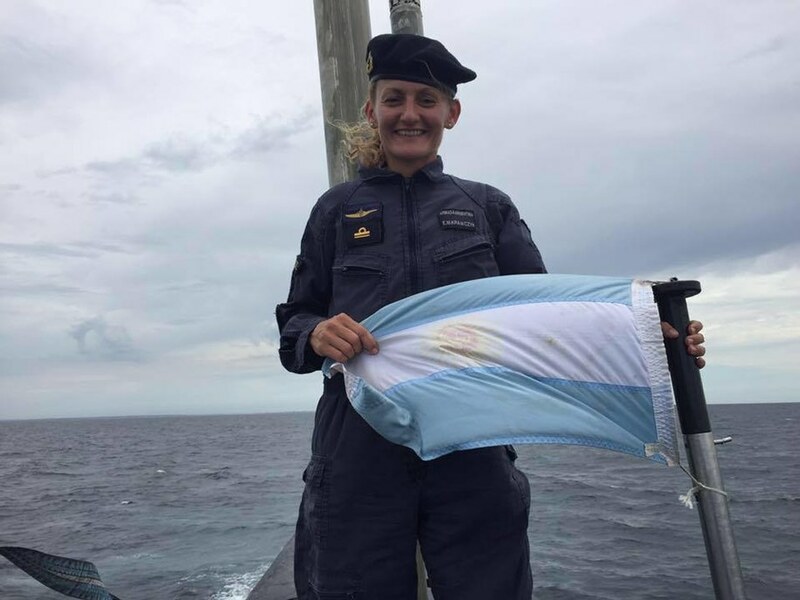 na pokładzie znajdowała się kapitan argentyńskiej marynarki Eliana Maria Krawczyk. Cześć Pamięci Jej i Jej Compañeros. No i co teraz — albo władze w końcu odkręcą trochę kurek z finansowaniem armii, albo stwierdzą, że skoro OP toną, to lepiej te pozostałe posłać na żyletki, tak będzie bezpieczniej i przede wszystkim taniej. Najbardziej prawdopodobne to nic nie robić, okręty pozostawić w służbie ale nie wysyłać dalej niż na redę - raz do roku. I to jest wyjście najprostsze.